The job titles listed below are typical of those individuals who are involved in selling natural gas and arranging for gas to be transported through pipelines to buyers. Some gas production companies employ their own marketing staff, while others contract with marketing companies to perform this service. Market Research Analyst Studies the market and devises best practices for marketing natural gas. Four-year degree or better in marketing or economics. Natural Gas Marketer Coordinates and conducts sales of natural gas between various entities including producers, resellers, pipelines, and end users. Four-year degree or better with strong background in finance, risk management, and marketing. Trader Buys and sells natural gas futures contracts. Four-year degree or better with strong background in finance, risk management and, marketing. The job titles listed below are typical of those for companies and individuals who work in conjunction with oil and gas companies to acquire property, mark boundaries, etc. for drilling projects. These careers offer a mix of office and field work. Abstractor / Title Examiner Searches public records and examines titles to determine a property title's legal condition. High school diploma or two-year degree. Requires courthouse knowledge and the ability to work through legal documents and titles to create an ownership chain. Background in real estate law helpful. Lease Agent / Land Agent / Landman Works on behalf of the oil and gas company to acquire land for operations through leases, purchases, and access/usage agreements. Coordinates with the survey company, the oil and gas company, and the land owners. High school diploma or two-year degree. Requires good people skills and the ability to negotiate. Requires a legal understanding of mineral ownership, a basic familiarity with exploration and production operations, and a general understanding of geology. Surveyor Determines property boundaries. Lays out oil and gas projects. Creates maps. Surveyors are not required to have a college education, but state licensing requirements make it preferable to earn one. Vocational training in civil engineering, mathematics, physics, statistics, geometry, drafting, blueprint reading, and computer science are helpful. Surveyor’s Assistant Assists surveyor in determining property boundaries and laying out projects. High school education or better with a strong background in physics, science, and math. The job titles listed below are typical of those for companies that work in conjunction with drilling contractors and oil and gas companies as new wells are drilled and brought into production. Most of these are outdoor jobs that offer plenty of opportunity for overtime. Service companies also employ general office staff such as receptionists, managers, bookkeepers, and human resources specialists. Cement / Frac Crew Assembles and operates hydraulic pumping systems to pump chemicals, gases, sand, cement, or other material into well. At least some high school education. Electronics Technician Identifies electronics, measurement, and control needs. Maintains, repairs, calibrates, and evaluates field measurement and control equipment. Minimum two-year technical degree or equivalent experience. Mud Logger / Hydrocarbon Data Analyst	 Collects, analyzes, and records the solids, fluids, and gasses brought to the surface by the drilling fluid (mud). High school education or better, with a strong background in chemistry, science, and math. Sales Representative Conducts sales calls, responds to customer requests, and resolves any customer complaints. Schedules cement and frac jobs. Prepares bids. Five to 10 years experience preferred in gas/oil well service industry. Service Rig Operator Assembles and controls truck-mounted drilling and hoisting equipment used in the servicing of oil or natural gas wells. High school diploma. Truck Driver Operates trucks used to move equipment and supplies on and off highways in all types of conditions. Commercial driver’s license required. Specific CDL endorsements may be needed. Wireline Operator Performs various services on oil and gas well drilling and service rigs. Lowers specialized equipment into wells so that wireline crews can use measurement instruments to gather information about the formations in the well. Retrieves broken pieces of equipment from the well. Perforates wells that are going into production. High school education or better, with a strong background in chemistry, science and math. Oil and gas production companies use excavation contractors and timber cutters to clear land and build roads, well sites, tank batteries, compressor stations, pipelines, and power lines. The job titles listed below are typical of those for professionals involved in supporting oil and gas production companies as they make preparations to drill for oil and gas in an environmentally responsible manner. Many of these positions offer a mix of indoor and outdoor tasks. Environmental Technician Develops and implements Environmental and Erosion Sedimentation Plans. Has a complete understanding of environmental law and regulations and their application to the oil and gas industry. Develops and implements Spill Prevention Contingency Control Plans (SPCC). Completes water testing analysis. Minimum two-year degree in environmental technology or related field. Chemical Technician Performs laboratory tests and tasks on soil and water samples. At least a two-year diploma in chemical technology or a related program. Soil Scientist	 Conducts soil surveys. Recommends soil management programs. Helps design hydrologic plans. Manages soils for landscape design, mine reclamation, and site restoration. Has a strong background in the physical and biological sciences and mathematics. Four-year degree in environmental soil science. The job titles listed below are typical of those for professionals involved in supporting oil and gas production companies in exploring for oil and gas. Many of these positions offer a mix of indoor and outdoor tasks. Field Engineer Supervises all aspects of drilling, completion, and workover operations. Two- or four-year college degree or five-plus years experience in field operations. Geo Tech Collects and analyzes geological data for petroleum exploration. Often works in teams with geologists to determine where underground deposits of oil and gas may be. Two- or four-year college degree. Geochemist Studies the liquid, gas, and mineral deposits contained in rocks. Provides valuable information about the rock formations encountered while drilling for petroleum. Four-year college degree or higher. Geologist Surveys and interprets an area's geological rock structure. Assesses the prospects of producing oil and gas in that area. Four-year college degree or higher. An advanced degree is needed for many research positions. Graduates with physics, chemistry, mathematics, or computer science degrees may qualify for some positions if they also studied geology. Geophysicist Studies the Earth using gravity, magnetic, electrical, and seismic methods to determine likely locations of oil and gas reservoirs. Four-year college degree or better in geology. The job titles listed below are typical of those in oil and gas drilling operations. These are physically demanding outdoor jobs with plenty of opportunity for overtime. Drilling rigs operate around the clock in all types of weather conditions. Drilling companies also employ general office staff such as receptionists, managers, bookkeepers, and human resources specialists. Derrick Hand Handles sections of pipe from a platform on the rig derrick during drilling. Operates and maintains drilling mud systems and pumps. Records mud flows and volumes and takes samples. Operates and maintains drilling rig diesel motors, transmissions and other mechanical equipment. Assists in setting up, taking down and transporting rigs. Supervises floor hands and laborers. High school diploma. Driller Supervises and organizes the well drilling crew. Operates drilling rig controls and monitors drilling operations. High school diploma and possibly some vocational traning or job-related coursework. In some cases, an associate's or bachelor's degree could be needed. Drillers need anywhere from a few months to one year of working with experienced employees. Floor Hand/Roughneck/Rig Hand Operates well drilling and service rigs. Assists with the connection and disconnection of pipes used in drilling performs general maintenance tasks around the rig. At least some high school education is required. Mechanic Mantains and repairs equipment, much of it diesel-powered. Previous experience or trade school required. Roustabout Performs pipe fitting and all-around mechanical tasks. High school diploma. Truck Driver Operates trucks used to move equipment and supplies on and off highways in all types of conditions. Commecial driver's license required. 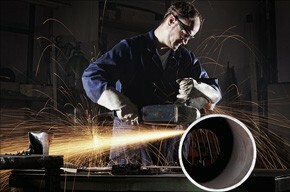 Welder Performs a wide variety of welding tasks outdoors and in the shop. High school diploma and welding school certification. The job titles listed below are typical of those in oil and gas production operations. Many of these are outdoor jobs with regular hours. Oil and gas production companies also employ general office staff such as receptionists, managers, bookkeepers, and human resources specialists. Compressor Operator Maintains and troubleshots natural gas compressors and equipment. Requires good mechanical skills. May require training in compressor and dehydration equipment. Draftsman/Cartographer Supports the work of engineers, architects by preparing drawings, maps and specifications. Two-year college degree or higher. Driver Operates trucks used to move equpment and supplies on and off highways in all types of conditions. Commercial driver's license required. Specific CDL endorsements may be needed. 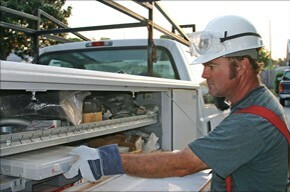 Electrician Installs and maintains electrical equipment. Trade school certification or two-year college degree. Equipment Operator Operates heavy equipment typically used in production operations, such as bulldozers, backhoes and excavations. Commercial driver's license may be required. GIS Specialist Creates and maintains geographic information system (GIS) databases that enable companies to capture, store, analyze, and display information related to the location of oil and gas well sites, pipelines, compressor stations, roads and other facilities. Technical school training or a two or four year college degree. Lease Hand Performs general labor tasks. Must work outdoors in all weather conditions. At least some high school education. Mechanic Maintains and repairs automobiles, small and large trucks and diesel equipment. Previous experience or trade school certification. Petroleum Engineer Analyzes production for problems and makes recommendations for remediation or workovers. Four-year college degreee or higher. Production Foreman Oversees pumpers and other field personnel. High school diploma. Pumper/Well Tender Looks after oil and gas wells, monitors the progress of the well and ensures all equipment is functioning properly. At least some high school education.